URGENT INFO: The Iranian free energy scientist who has been working in Italy with his team to reveal a form of free energy to the world is being threatened and has had his site taken down and interfered wih. He is currently in great concern for his life and making arrangements to have his material distributed around the world on the internet in various ways to preserve this vital infromation. ORIGINALLY BROADCAST LIVE ON LIVESTREAM SUNDAY MARCH 16, 2014 AT 12 NOON PACIFIC TIME. 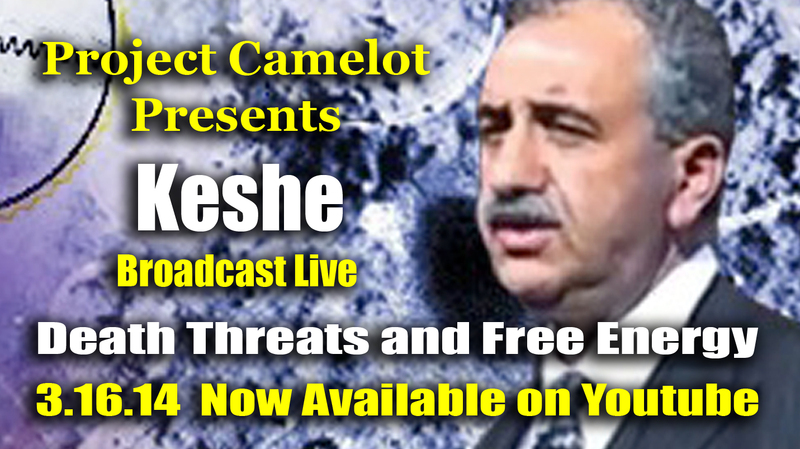 This is a crucial interview with Iranian free energy scientist MT KESHE. He has been threatened by the illuminati ex-king of Belgium and others in power. He and his family are being threatened with torture and death. He describes the physics and the secret of free energy he is releasing through documents on the web. Note : they are now attacking our website and server non-stop. Obviously, the Illuminati are threatened by this truth. Please support this work and send positive radiant energy to protect Keshe and his family. Go here to listen to the detailing of the various Belgium authorities that are threatening Keshe’s life and family. He gives names and details regarding the assassination attempts. A recent workshop on live-stream. The documents in different languages released this week. The 20.3.2014 the CO2 workshop. The Workshop of the next week on 20.3.2014 at 8 am CET ( Italy). in this session we will show the full process of how to convert gases to solid at room temperatures and pressure. This is one of the most important workshops undertaken by the Knowledge seekers. The material produced in this workshop is then sent to FUKUSHIMA to understand how the radiation can be extracted from the water and soil. We expect positive results from some of the materials and some might not be effective if our process has not created the right SP2 in, on or within the layers. Please listen and recored this presentation, as it will be very much the the most important workshop of the Foundation and Knowledge seekers. The site and the forum are going through changes, which brings more control in the hand of the knowledge seekers with direct response from the panel of the knowledge seekers to all questions rather than remote monitors just approving the posts. The past week posts will be cleared and uploaded, we apologies for this delay. The Keshe Foundation is entering its most crucial phase and we need to have direct input from the board of knowledge seekers on how we present and respond to the new challenges. To see our 2014 Roadmap through we are launching the following. 1: Building of the new spaceship this year is our priority and the development of this craft has started this week goes into commercial development phase. We are planning for the Launch and flight of the First spaceship before the end of this year. There will be more announcements in the coming weeks. We need scientists who can help us with the design and testing of different parts of the spaceship and we need computer programmers for the control of different systems of the craft. We need specialists in gas, food storage and control, we also need doctors with knowledge in space technology. We have no weightlessness condition on board of these crafts, so flights are planed from northern Italy and no training will be needed to take these flights because gravity will be created naturally by the reactors inside the crafts. 2: The Keshe Foundation will announce more about the launch of these crafts in the coming weeks in its workshops as they are planned for this and next year. We have sent an invitation to NASA and Boeing though our contacts last week for them to come to the institute and hopefully to collaborate in developing the first spaceship. This month we will reach more space groups around the world for their collaboration. 3: We are launching the recruitment of the second group of up to 25 new Knowledge seekers for the course to start in May 2014. 4: We have started planning for the world peace conference for governments and citizens in April or May with the presentation of new technologies of the Foundation as the platform to force world peace. 5: We start this month the program to accept 250 Knowledge seekers for September or December of 2014 in the institute. 6: We will launch the full teaching program for the production and use of the Health units in the coming weeks. 7: We will launch and teach the full program in how to make systems for the absorption of CO2 by reporting through direct lab sessions as with the Fukushima video, we will provide directly from the lab of the Keshe Foundation live or recorded sessions of making the systems and showing how they work. All knowledge gained in these processes and flights will be released freely to the world population unconditionally and as a gift from us to humanity for a better life and creation of peaceful environment that we can all live a fruitful life in serving and entering the final stage of the opening of the doors to the Universal Community for the Human race.